Metering manholes offer a wide range of applications, including monitoring effluent and influent flow, for industrial and municipal organizations. The Warminster Fiberglass Company produces top of the line package metering manholes. 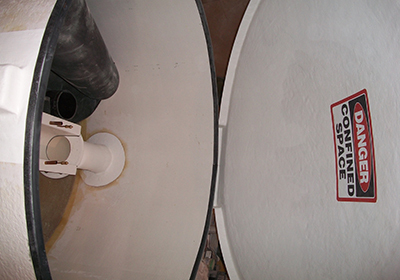 Our metering manholes comply with the ANSI/ ASTM D-3753 ‘Standard Specifications for Fiberglass Manholes. At Warminster, we understand the need for convenient installation and set up when it comes to metering manholes. This is why we design units that are ready to install and you can start using them without any delay. We also equip our metering manholes with integral Palmer-Bowlus or Parshall Flumes, depending on your requirements. The only part you have to worry about is preparing the site for installing the manholes, as they are completed and packaged. This makes our metering manholes user-friendly and flexible. We can customize the specifications based on your needs, so you can get the best value for your money. The key to making metering manholes work is preventing leakages. We do this by laminating over each point of exit and entry on the joints. For this, we use resin and fiberglass, to ensure efficiency and durability. You can rest assured the water will not flow into the manhole once you have installed our metering manhole. We realize the hassle involved in dealing with underground water flooding and our metering manholes prevent that. To further enhance the performance and security, we mold in pipe sleeves on both ends, i.e. the outlet and inlet. This is done in accordance with the size of the pipes. We further seal the flow using stainless steel clamps and rubber boots so you can connect them easily. Regardless of the intensity of the application you want to use our metering manholes for, we assure you will enjoy a sturdy performance.